I've posted quite a bit about the various trees and plantings in our #newoldbackyard this past year, but I just looked back in the archives and discovered that I haven't posted about one of the most important (and highly anticipated) tree projects on the docket. And...that tree project *is* a series of Frans Fontaine European Hornbeam trees along the northern fence line near where our screened porch is located. 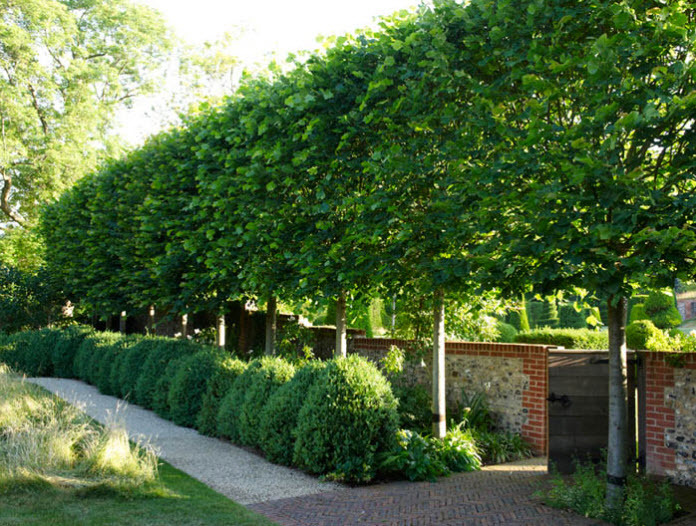 The image above - which isn't mine - gives you a sense for what we're going for with this allee of hornbeams and also shows how some closely planted Frans Fontaine Hornbeams grow to form a nice privacy hedge. This is part of the new - and mostly final - landscape plan that was delivered to us in September. I first posted a look at it in early October with a look at some of the hydrangea beds along the south property line and then a look at some of the foundation beds near the rear of the house a few days later. This is the 3rd piecemeal look at parts of that plan. I have posted about the specific spot in question that we're planning on planting these trees back in May of this year, but in that piece, we were talking about flowering pear trees. But, after talking to the landscaper and some nursery visits, we've changed lanes and have focused on these European Hornbeams. In that post, you can get a sense for how close our neighbor's garage/storage area is to our fenceline, but you can't really tell the elevation change. And that's what causes the privacy issue. Our house is about eight feet up front the low spot where the fence is placed, so if you are standing on our patio or in our screened porch, you can basically see right over the fence easily. 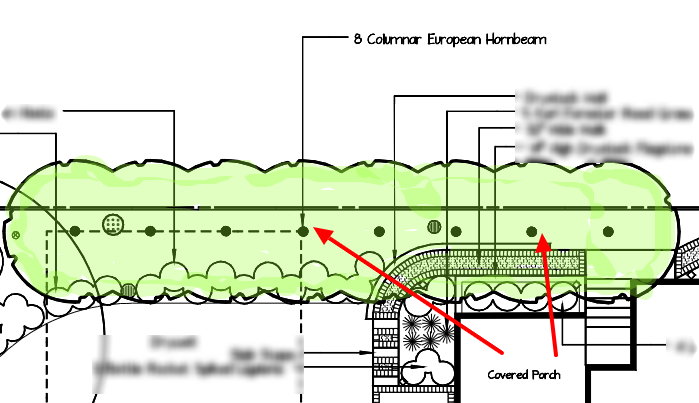 The landscaper has come up with this solution that calls for eight (8) European Hornbeams that I've colored in green. You can see how big of a span this is and how it changes the view/creates a privacy hedge for the patio and screened porch. Hence, the privacy hedge. But, why the change from flowering pears to Frans Fontaine European Hornbeams? It was more about what we *get* with the Frans Fontaine Hornbeams and not what we don't get from the flowering Chanticleer pear tree. From this piece titled "The Useful Hornbeam", comes this list of characteristics which are in direct polar opposites from the flowering pear which is fast growing and short-lived. A complete privacy wall may be formed with the hornbeam. The wall can be sheared if there is too little room to allow the trees to reach mature size. ...The trees are long lived and have few pests. The wood from the tree is very hard (Carpinus lumber is sold as ironwood) so is used infrequently since it is difficult to work. Life span is 300 years or more. In ten years it seldom spreads more than 6 to 8 feet while reaching a height of 20 to 25 feet. A handsome tree, the summer foliage is a rich green becoming a gold yellow in autumn. So we have a very narrow and columnar (that's a word!!?!?) tree that grows just six feet wide, lives forever and has no pests to attack it. Sounds perfect for us, right? We're not going anywhere and have a narrow gap to fill to create some privacy between our neighbors on the north side. Right now, we're planning on something like 2" caliper trees planted about six feet apart that will both allow for the trees to grow and mature to fill in the full hedge, but also provide some immediate privacy next Spring and Summer as we use the porch more and more. The nursery only digs these Frans Fontaine Hornbeams in the Spring, so we couldn't plant them this fall, but this will be one of the first projects I take on as the weather breaks come late April or May. These eight trees will more than double the number of trees planted in the backyard in just a bit over a year. In 2017, we planted nine total trees at our new house, but two of them (one flowering pear and the Saucer Magnolia) were planted in the front yard. If you look closely at the other parts of the backyard plan, you'll see that they call for a few bunches of Canadian Hemlocks out back, so the total number of trees is going up, up, up next Spring.